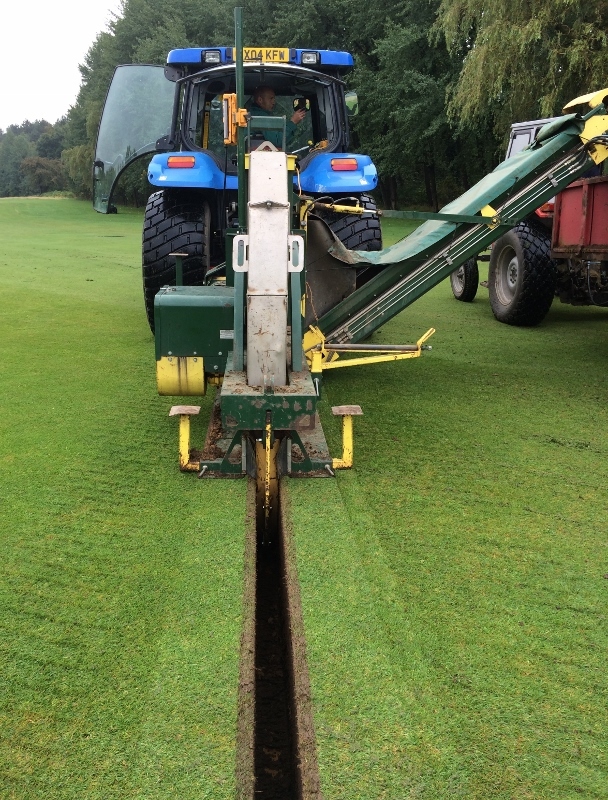 Shelton have had much success in golf course drainage and our machinery has helped to improve the drainage of many prestigious golf courses, including Sunningdale, The Wisley, Farnham Golf club, Henley Golf club to name a few. Plus, with Shelton machinery and drainage techniques you can ‘drain today and play tomorrow ‘as in the vast majority of cases your surface can be back in play within 24 hours of the work being carried out. The need for fairway drainage can occur for a variety of reasons. You may have an underperforming primary drainage scheme which needs the addition of secondary drainage to improve its effectiveness; alternatively some primary drainage may be required. Whatever your golf course drainage requirement there is a Shelton machine that can help you to tackle it. For primary drainage you need to look at our Supertrencher + series of trenchers or our chain trencher. These are perfect for digging trenches to install drainage pipes or other underground services on your fairway. Alternatively, if you need some secondary drainage, we have a range of gravel/sand banders or our System 25™ trencher to allow you to improve your primary drainage. The majority of golf courses constructed in the last 30 years have greens built to USGA standards and consequently they should drain well. In practise they were not all constructed with materials of the precise specification and improvement to their drainage may be necessary. By far the larger numbers of greens were ‘push-up’ using surrounding top soil. A drainage system was rarely installed in that era as golf was infrequently played in the wetter winter months. To rebuild an old-style green to USGA specification can be expensive. On top of this is the major disruption to the course lasting weeks, sometimes months. There are now three Shelton techniques available for draining established golf greens, some of which are the same as for secondary drainage. Using these techniques greens may be re-opened for play in a matter of hours or days depending on circumstances. "The greens drainage has transformed the course"
Closely spaced gravel bands each 20-25mm wide leading to a piped drain situated just off the green. 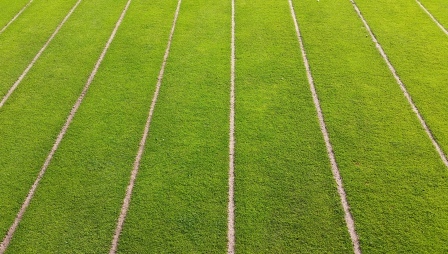 Bands of aggregate are injected into the green by a vibrating channel opener and as no soil is removed any surface undulations can be minimised by hollow tining prior to the installation. To see our range of gravel band machinery click here. System 25™ is a trenching technique where 25mm wide trenches are dug by a high speed wheel. The arisings are conveyed into a trailer running alongside and simultaneously Lytag or gravel is vibrated into the open trench in a one pass operation. The gravel-filled trenches lead to a piped drain just off the green. Lightning Drain™ is very similar to System 25™ except the trenches are dug 35mm wide and a 25mm perforated land drainage pipe is installed prior to backfilling with Lytag. We know of no faster land drainage system when the pipes are spaced at 500mm centres. If you have any questions about your golf course drainage requirements contact us.